For today's Foodie Friday post, I thought I would share my version of a recipe that just about everyone has, especially if your a Southerner. Yes folks, it's Potato Salad! We eat it all year, but when the summer heat rolls around, as it has now, there is always a bowl in the fridge. On this day I started with the last six potatoes we had left in the pantry. I use one egg for each medium sized spud and add another one for each six potatoes to use for garnish. My technique for boiling is simple, I cover the eggs with cold water, cover the saucepan, bring just to a rolling boil, remove from heat and let sit for about ten minutes. Be sure to peel them while they're still warm, so the shells won't stick. I should note here, for those who don't know, that for potato salad you need to use a low-starch potato. Why? Because they hold up to boiling and won't fall apart. For everyday potato salad, I use good old white potatoes. When it's a special occasion, I use fingerlings, I love them, but they don't fit my budget for everyday. I have other potato salad recipes in which I use red potatoes, but today we're making just plain old Southern-style. Onward and upward. While my eggs are boiling I peel my potatoes and cut them into bite-size pieces. Now, this is where it gets tricky and getting it right takes practice. I boil my potatoes until they're just past that "firm" stage, but not too soft. This is a personal taste and everyone will tell you different. When I mix my salad I want the smaller pieces to "mash" and the larger ones to stay whole, but be soft to the bite. My cousin Doris likes her almost completely mashed and I dislike intensely deli-style where the potatoes are hard. It's all a matter of personal preference. Okay, we have our potatoes and eggs boiled and we're ready to go. But wait, we need to chopped the eggs. I like my eggs cut chunky. I put them through one of those little egg slicer thingys and then quarter them. 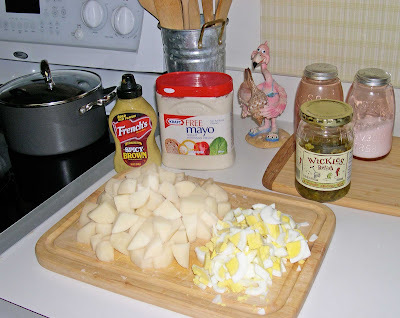 Now, when I was growing up our potato salad was always made with Miracle Whip, French's Yellow Mustard and diced sweet pickles. As you can see I use non-fat mayo (my use of mayonnaise caused many arguments with my daddy when I switched), spicy brown mustard and Wickle's pickle relish. If I'm out of Wickle's, I resort to chopping sweet pickles. I don't care for other brands of relish. Measurements for these condiments is again, personal preference. I use about a tablespoon (not the measuring kind, the table kind) of mayonnaise, a small teaspoon of mustard and a teaspoon of pickles for each potato. These measurements produce a nice, creamy potato salad. Season to taste with salt and pepper and voilá, it's ready. One more thing I should mention, and something my non-Southern friends can never understand, is that I serve my potato salad warm. Yep, that's how we do it in the South. Even when I eat the leftovers, I pop them in the microwave long enough to take off the chill. So, here is the result. You can see I garnished my potato salad with sliced egg and a sprinkling of paprika. The finishing touch at the Tiki Hut is to add the tiki salt and pepper shakers. 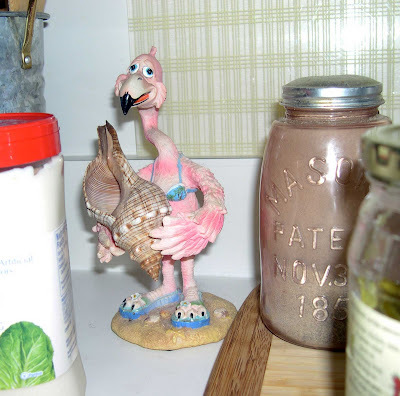 While we're in my kitchen I thought I would introduce you to Fannie, my kitchen flamingo. She is my cooking companion and always brings a smile to my face. Isn't she just too cute? That's it for today's Foodie Friday, now git on over to Designs By Gollum for more of today's postings. 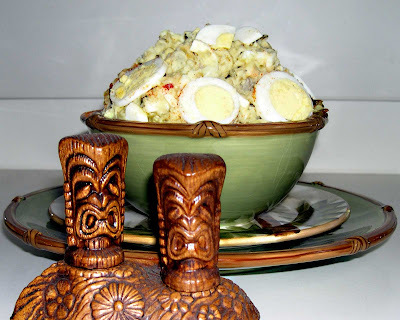 Your potato salad looks yummy... a great "comfort" food!! Have a great weekend. Next time you make that, let me know - I'm coming over! Looks amazing. Yummy - a great 4th of July favorite. All Iwanna know is:"Where'd you get that flamingo?" It's to die for!I want one! Yum, potato salad! I am with you about switching to mayo. My sister still gives me grief for changing. and I like my potatoes done, not hard. And love it freshloy made and warm, too! but I do like eggs so I use one per potato. Can't wait to make it again! Looks like good old fashioned potato salad -- simple yet delicious. Love your recommendation of the brands that you use. in my house we call it "Russian salad" and use green beans instead of pickles, sometimes carrots, and others in Spain put olives (not me, don't like 'em) No mustard. is a staple here in Spain as well, you can get it in just about any bar, is one of the most commonly ordered "tapas" with a beer. Yes, honeysuckle, I use one egg per potato also. Then I boil another egg for every six potatoes to use for the garnish. 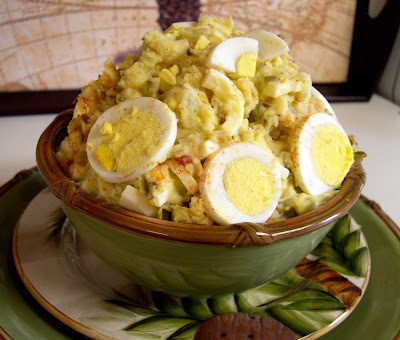 You can never have too many eggs in potato salad! Can't have a summer with out good ole potato salad! Sounds yummy! Yep, it's got to be mayo for me too! My mom taught me a trick for perfect potatoes (and eggs) every time...steam them. I put my unpeeled potatoes (any kind) in a big steamer pot and throw my eggs right on top. Cover and let steam 30 or 40 minutes, or until potatoes are fork tender. You can peel the potatoes while they are still warm or even after they have been refrigerated overnight. Either way, the skins come off easy and the potatoes hold their shape. Do you ever get frustrated with eggs that are a pain in the ... to peel? Steaming the eggs instead of boiling allows the shells to slip right off too...NO more fighting with those stubborn tiny bits of eggshell that just won't come off! I even steam my eggs when I'm going to make egg salad or deviled eggs. Mmmmm... looks delish! And great dishes! Oh Yum!!! Your potato salad looks great and I love the bowl you have it in. Can I come over? I'm the only potato salad lover in the family so I don't get it very often. Yours looks wonderful! I'll take a bite of that!! I love potato salad and yours looks delicious! Ok Fannie, here's a question. Can you buy Wickle's north of the Mason Dixon line? Your PS looks scrumptious. Funny, I don't think I've met a potato salad that I didn't love :). Yours looks diving... love the presentation shot! This is so different from the Pennsylvania Dutch Potato salad I am used to but Hey, Life is all about change I'm going to give this a try. It sounds really good.